I hardly ever read non-fiction, but I gave this one a try and really enjoyed it. This was a most interesting read. I’m not sure all of it applies to me, but I’d very much like to put to use the things that do… I’m currently rating it 4 stars since not all of it applied and I don’t know if it will help, but I hope to find it even more helpful, and if I do I’ll be revising my rating and review at some point. Many of the ideas seem very insightful ones which I’m looking forward to studying deeper and hopefully using myself. This small book is a mix of all those things. 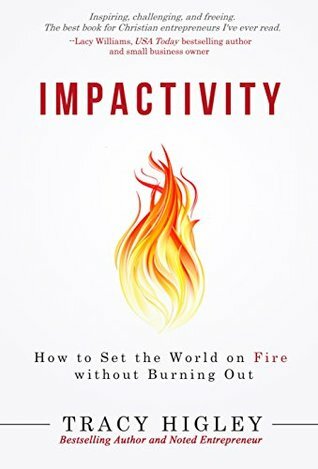 There is often a tendency (especially in this procrastinator) to reread, carefully study, and plan to put those thoughts in that advice book into use… but then to put it off, forget it, let it slide, and return again to the continual frustrations of a life full of stress and lack of focus. It happens to me all the time. It may even happen this time. But I would very much like to implement many of the steps in this book, so I hope to reread it and think about these things further. It’s a quick read, and written in a gripping, easy to grasp sort of way. It’s from a Christian perspective, which I was glad of, and hit a perfect balance of pointing out that without God at the center, the rest will fall apart, but also of giving helpful practical advice. The chapters of advice are interspersed with chapters of an ongoing fictional story where a group of friends go over the advice as presented to them by another woman–all of which had a sort of richness to it in its writing as well. So it’s half advice, half story, which was rather fun and different-seeming. Julia felt a little pity at Melanie’s expression. Victoria did have a tendency to say things that sounded more like Gandalf than a real person. I found this book for free when it came out, so it’s not exactly as though I invested anything into it besides the time to read it, but I’d say it may be worth it for others to pick it up if you’re struggling as I am with a chaotic mass of guilt and todo lists and struggling to find what it is that’s my “dream” and wondering how to escape from the stress of daily life’s vicious cycles. Again, I’ve no idea if these things actually WORK, as I’ve not implemented them. But it may be worth a try. Dreams are worth following, aren’t they? Even when one doesn’t know what that dream is yet? Which means it may be time to find out? Oh wow, this does sound like a very fascinating read! I like the idea of it being half story, half nonfiction. I’ve read one other “self help” book like that before and I loved it. I think it’s a neat way to do things, really keeps us reading. You’re so great to read this. I pretty much never read nonfiction books these days. It’s horrid. I think I used to read more when I was younger than now. I should be reading MORE the older I get not less! Bad, bad, bad. And I definitely have that tendency of meaning to go back and really study and apply these self help books but then…never do. Good for you for taking the time to read it! Thanks for the review! I may have to look into this one.